As summer approaches, Sony has announced its 2016 lineup of sound gear to keep those beach jams on full blast, no matter where you are. The company's new range, many of which are either available for purchase online and/or due on physical store shelves later this month, includes a razor-thin sound bar built for smartphone interaction and a high-tech turntable for the especially enthused audiophile. The HT-NT5 TV Sound Bar (pictured above, bottom and right) sports a slim design intended to service six speakers. The HT-NT5 is also built to use Google Cast, as well as support Spotify Connect, Pandora, and Google Play Music. That said, prepare to sport an equally slim wallet, as the experience will set you back $800/£600. Sony's SRS-ZR5 (picture above, left) and ZR7 are more merciful at $300/£260 and $200/£170, respectively. 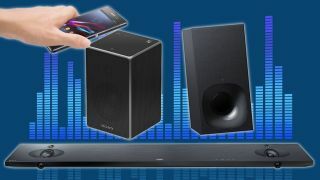 The Bluetooth-enabled wireless speaker setup is compatible with Google Cast, and like the HT-NT5, can be linked with SongPal - Sony's remote app - for ranged control from your phone. While not pictured, Sony also announced a new A/V receiver, two Blu-ray players, a turntable, and high-end sound system. For those prepping for summer movie mania, Sony has unveiled the STR-DH770, a $350/£400 A/V receiver with 4K HDR video and 7.2 channel audio, as well as the $130/£150 BDP-S6700 - a 4K-upscaling 3D-streaming Blu-ray player with USB memory and SongPal compatibility. The UHP-H1, Sony's first Hi-Res certified Blu-Ray player, can handle SA-CD, DVD-Audio, Hi-Res Audio, MP3s and 4K scaling up to 60p. Format junkies drawn to the UHP-H1 can also control the device with SongPal, though it comes at a higher price than the BDP-S6700 at $350 (about £240). Finally, for the big spender with the a penchant for high-end equipment, Sony's PS-HX500 Hi-Res audio turntable and CAS-1 audio system offer major power for major money - $600 (£450) and $1,000(£727), respectively. However, those who take the plunge will have their hands on a high-quality LP turntable able to convert and store vinyl records for use on hi-res audio devices or a dual-amp audio rig that's compatible with LDAC, NFC signals, and SongPal for what Sony calls "an immersive listening experience whether using the unit's speakers or headphones." While the prices can quickly climb up, the lineup's flexibility of range should give anyone curious about home entertainment plenty to look into for their next summertime project. We just suggest leaving that $600 turntable inside during poolside cookout season so it stays dry.